Over 100 14-year-old pupils and staff at the Burlington Danes Academy, White City,West London have volunteered to be involved in a first-of-its-kind project to build a fully-functioning timber frame house on the academy&#39;s grounds. Master minded by Roderick James Architects LLP, an award-winning practice specialising in contemporary timber buildings, together with Principal Dame Sally Coates, the aim is to offer students with the aptitude for practical work to construct a small but comfortable, highly insulated house using construction tasks reflective of the curriculum in joinery, carpentry and building skills. All of the construction work will be supervised by full time lecturers and a specialist timber frame construction expert. Makita has provided drills and impact drivers for the pupils to use throughout the 12-18 month build, as well as practical training by Ray Wilby and Martin Dunn, full time trainers at Makita&#39;s Milton Keynes HQ, in the safe and correct use of these specific power tools. A selection of other high performance tools including jig saws, sanders, planers and mitre saws will also be provided. The challenge provides a practical and alternative approach to education with the students gaining a wealth of valuable hands-on experience. The project demands the development and application of a range of important personal attributes, such as communication, confidence, drive and discipline, as well as a variety of essential technical skills. When complete the &pound;150,000 School-House project will provide a short term boarding facility where teachers and 6-8 students can spend evenings of discussion, music and cooking in an informal atmosphere far removed from many of their home environments. The School-House will also provide a venue for parents and local pensioners to come along and be entertained and cooked for by the students. 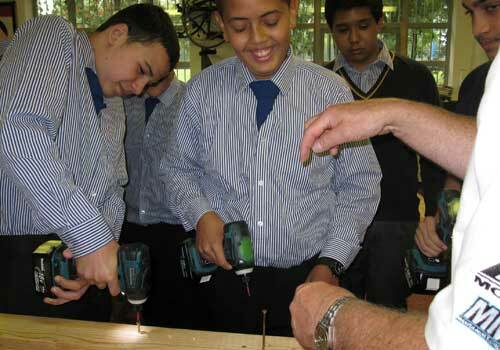 It is hoped that this project will be replicated by other schools in other parts of the country. For the latest company news and information, please see below.